This image, acquired by NASA's Galileo spacecraft on February 22, 2000, is the highest resolution image ever taken of Io. The resolution is 5.2 meters (18 feet) per picture element. Galileo viewed the surface obliquely, tilted 72 degrees from straight overhead. Illumination is from the lower right, but the topographic shading is difficult to see because of the strong contrasts in brightness of the surface materials. The bright areas are generally higher in elevation than adjacent dark areas. 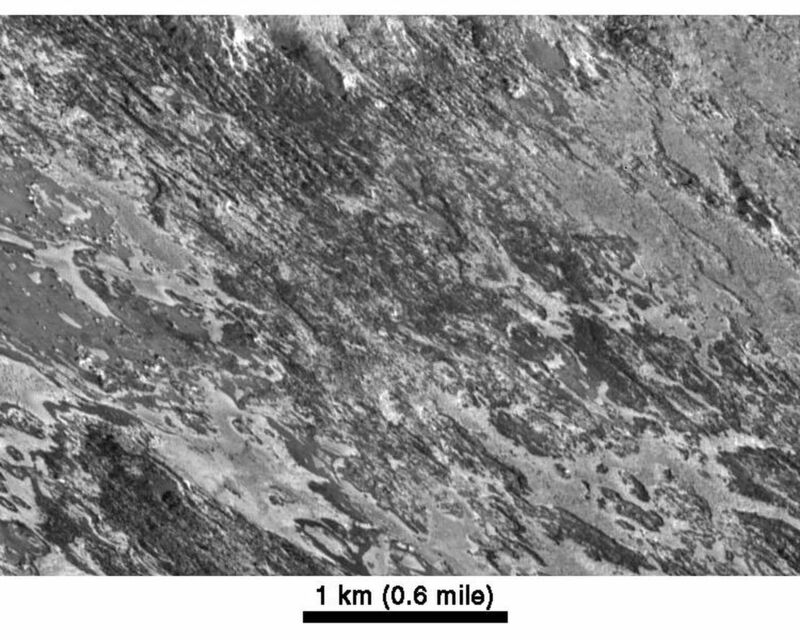 The surface appears to have been eroded by an unknown process, in places exposing layers of bright and dark material. Evaporation of solid ice may also play a role in separating the bright and dark materials. North is toward the upper right. 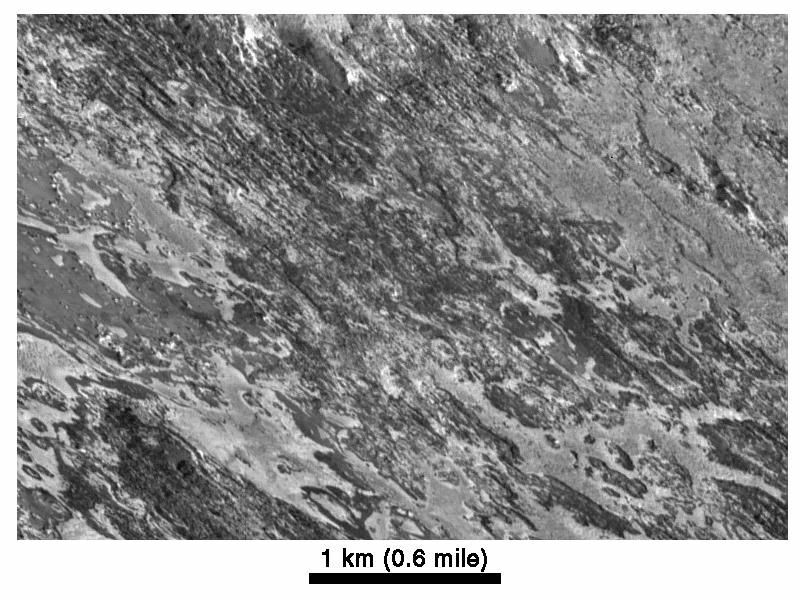 Also shown is a version of this image processed to give a bird's-eye view over the terrain. This image maps out the true distribution of bright and dark surface materials. This image and other images and data received from Galileo are posted on the Galileo mission home page at http://solarsystem.nasa.gov/galileo/. 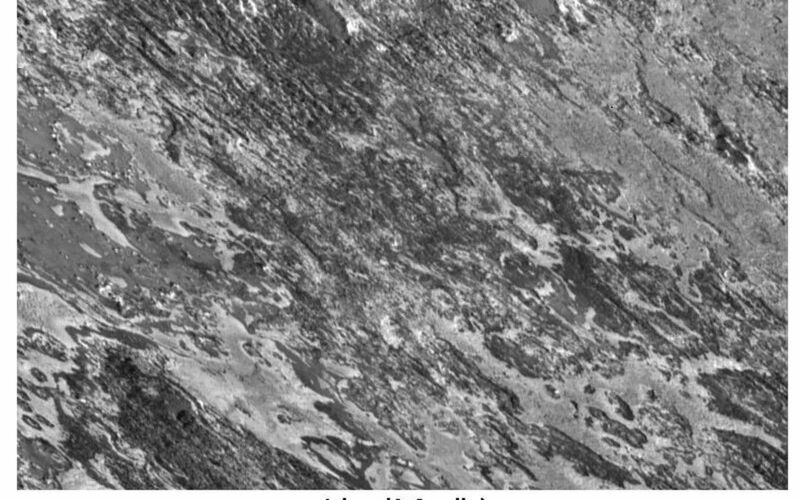 Background information and educational context for the images can be found at http://solarsystem.nasa.gov/galileo/gallery/io.cfm.